In my five years of collecting rayguns, I’ve learned to never buy or display anything too pricy… or priceless. Anytime a guest drops by, his instinct is to immediately swipe the raygun from the shelf, wield the gun in his right hand, and roughly depress the trigger several times, eliciting that satisfying rat-a-rat-a-whir from the gun’s bellows—it sounds like, if nothing else, a hard drive crashing. But as of right now, I am willing to make an exception to my No Delicate Rayguns policy. 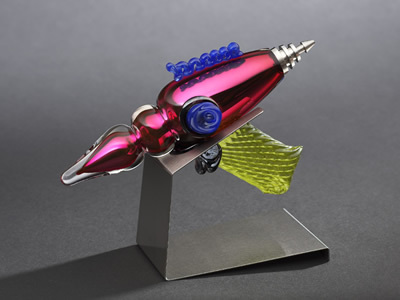 Blogger Michael Pinto located these gorgeous blown-glass rayguns, which are crafted by Joe Blow Glassworks’ Jeff Burnette.